Hey there, ribbon fans! :) I have a different kind of altered project to share with all of you today. Back in January, some friends invited my husband & I to their cabin in the woods of Pennsylvania for a weekend getaway. We had such a lovely time, walking in the snow and watching the deer come right up to the house. As we were putting wood into the stove one evening, I saw this cute little piece that I knew would make 'something' special one day and asked if I could have it. Our friend handed it right over. I decided it would be the perfect 'thank you' gift for our friends when a few little do-dads were added here and there. Really Reasonable Ribbon to the rescue! Here is that piece of wood, all gussied up and pretty-fied! The deer image was Mod Podged to the base, topped with a small piece of 2 1/2" plain cotton ribbon, die cuts added, and then decorated with Wild Orchid Crafts mulberry open roses & Chrysanthemums. The same cotton ribbon was used as a hanging loop and tied with hand dyed silk. 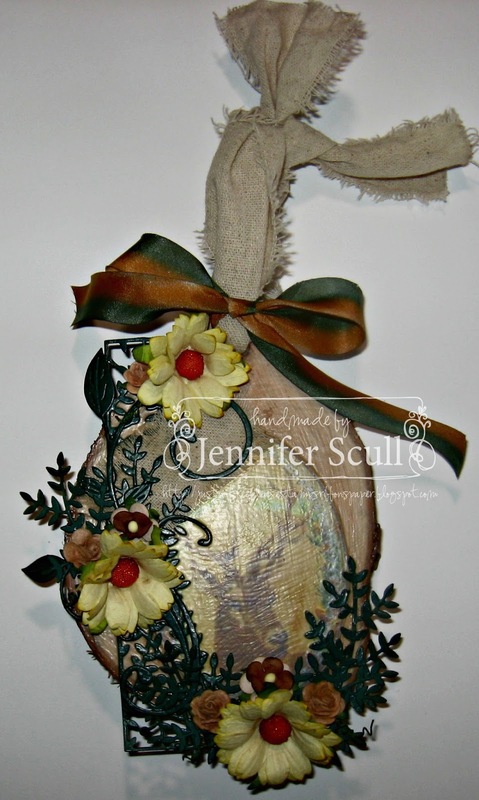 Try something new and make an altered project! It's so much fun! :) Be sure to enter our current challenge, too! Beautiful card. Love the deer on your card with the beautiful bow and flowers. We have elk in our fields right next to our house which is a big No No.